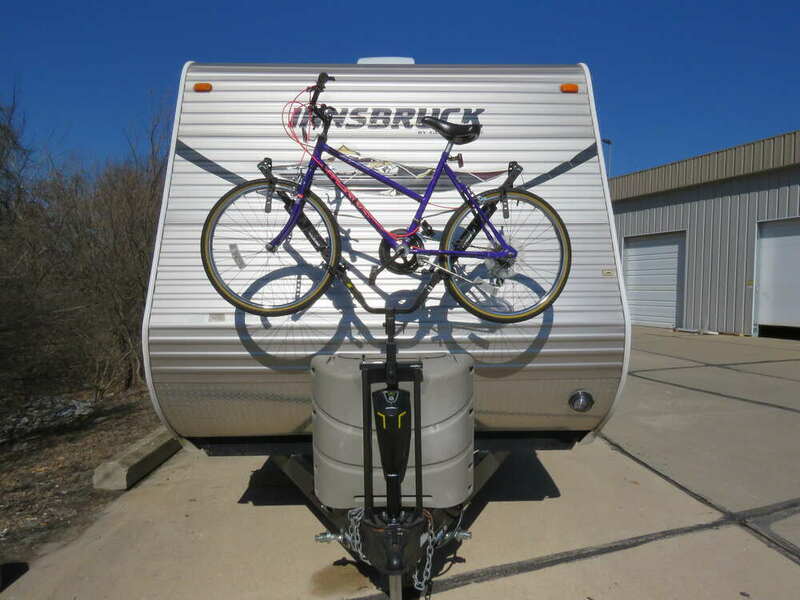 This bike rack installs on your A-frame trailer and lets you carry 2 bikes of almost any size or style by the wheels - no adapter bar needed. 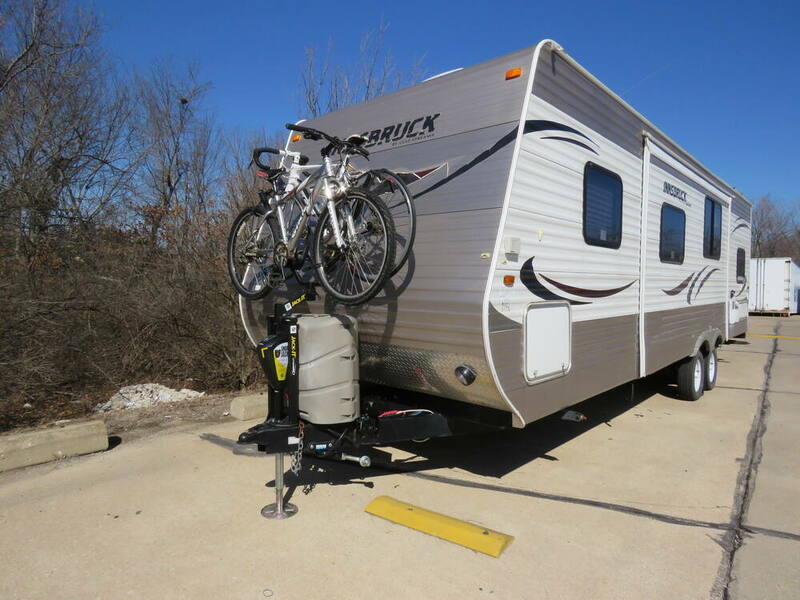 Keeps your bikes safely behind your tow vehicle where you can see them. 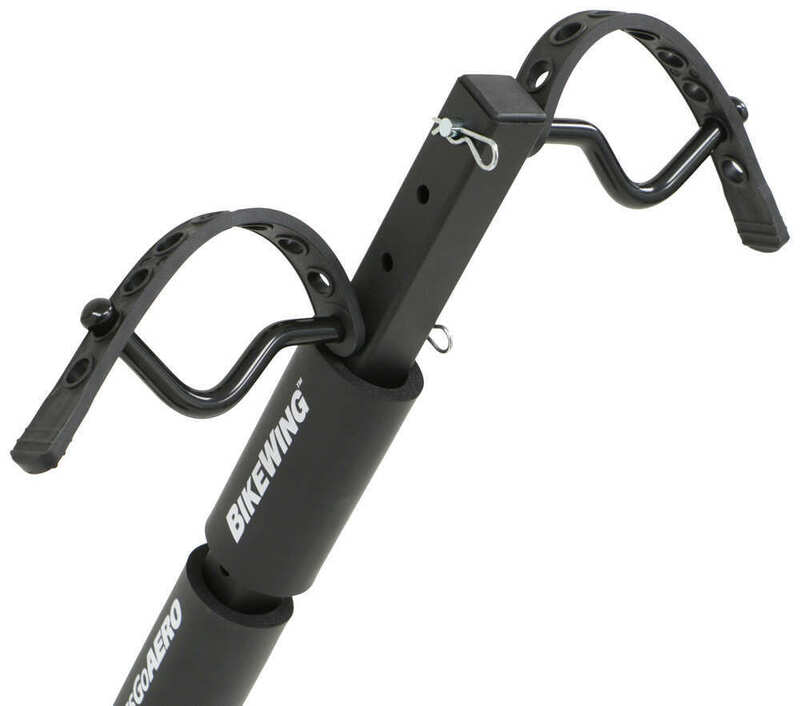 Foam bumpers protect bicycle finish. 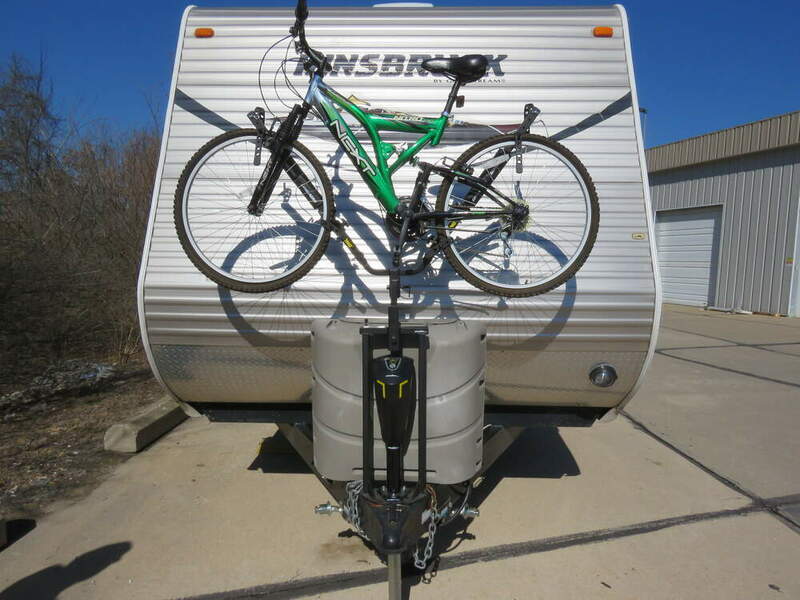 Lowest Prices for the best rv and camper bike racks from Lippert Components. 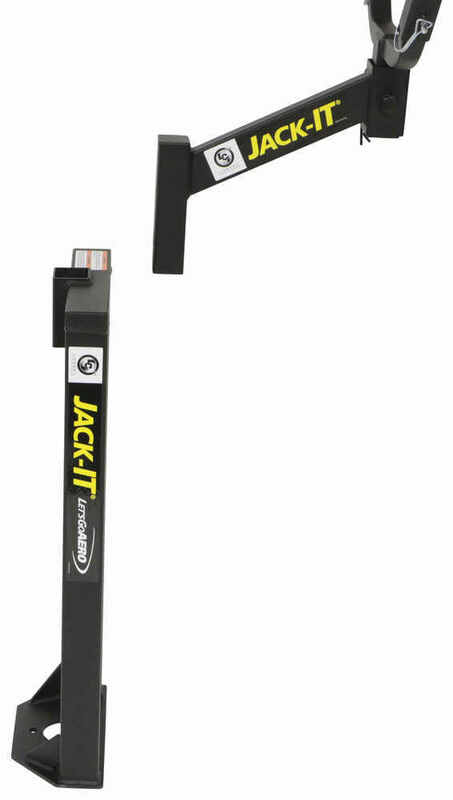 Jack-It 2 Bike Rack for A-Frame Trailers part number LC429756 can be ordered online at etrailer.com or call 800-298-8924 for expert service. 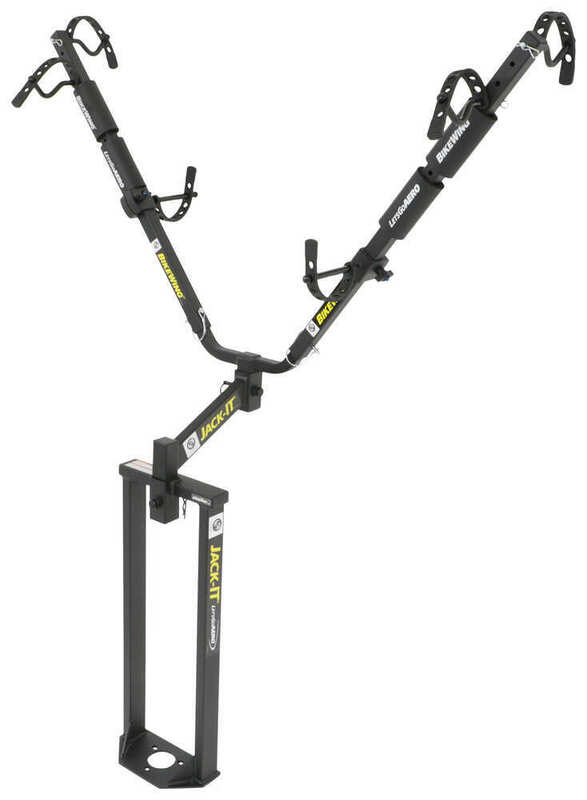 Heavy-duty hitch rack lets you carry 4 bikes on premium SuperCush anti-sway cradles with ZipStrip ratcheting straps. Dual arms provide excellent bike stability. 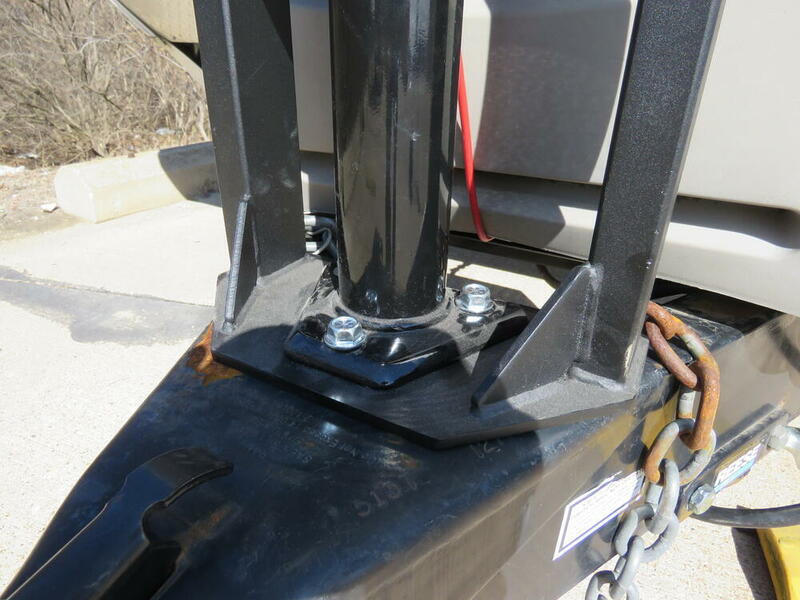 Threaded, anti-rattle hitch pin included. Hey guys. 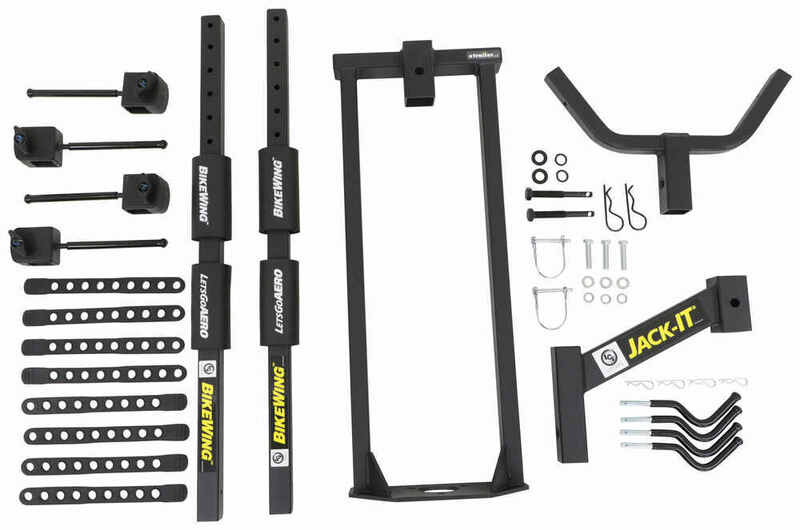 Today we're going to be checking out the Lippert Jack-It 2 bike rack. Now this right here mounts to your A-frame and allows you to carry two bikes attached to your trailer.You can see here how it's not going to interfere with your jack and it's especially great for campers because it's not going to interfere with your propane tanks.Now let's talk about how it holds our bikes. Four rubber straps keep our bikes in place. There is no frame contact. You can see here how the cradle has a V design, that way our wheel sits down inside and then the rubber strap goes over the top keeping everything in place. Then on the bottom we have a peg style to further support our bike with that same adjustable rubber strap. I've gone ahead and taken off the bikes so we can take a closer look.The bike rack features of V shaped design with padding that is adjustable along the arms. This is going to help with bike to bike contact and bike to rack contact. 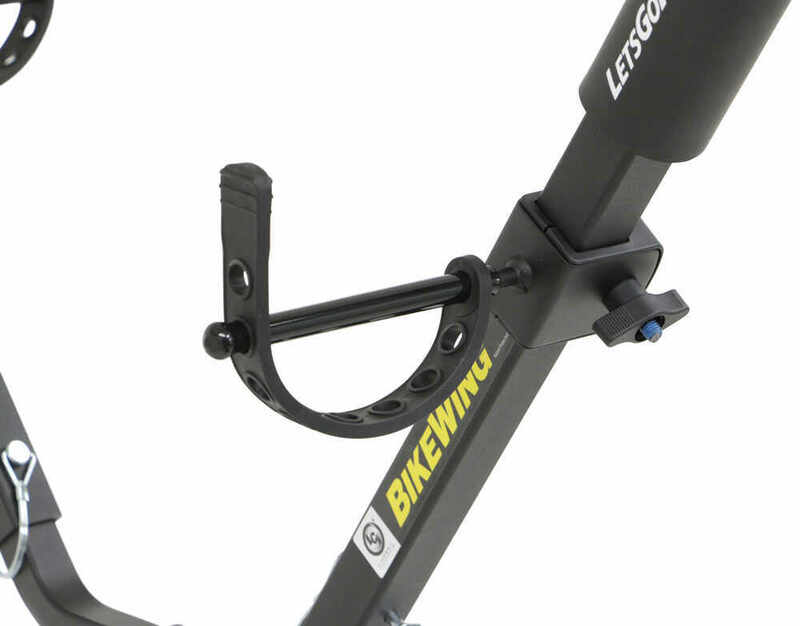 The pegs and the cradles are adjustable for different size bikes. This is also going to help with bike to bike contact. It's going to prevent things like our handlebars and seats from coming in contact with one another.You could see here on the cradle style, you simply just pull the pin pull it out, adjust it to a different hole, put it back in and replace the pin. That way you can adjust one bike higher than the other. The pegs are adjustable by a knob. 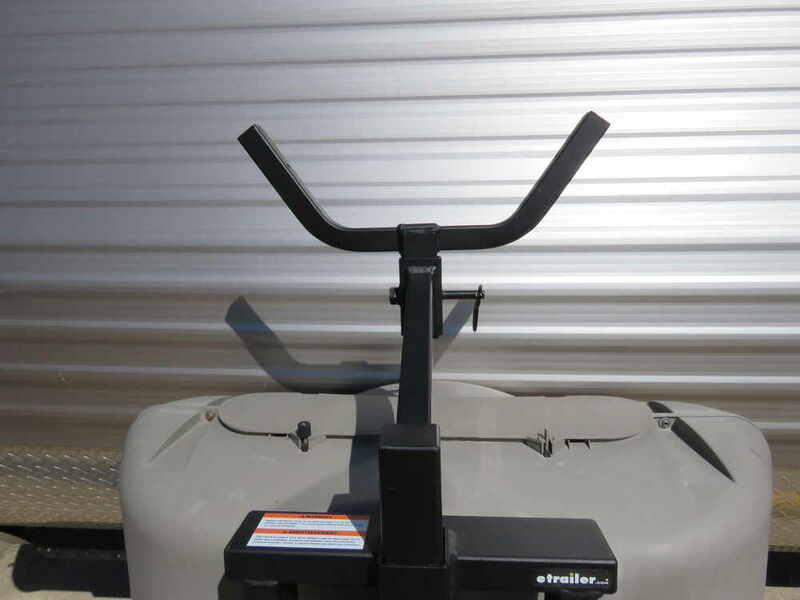 We'll simply loosen it up, adjust it along the arm to your desired location, and then tighten it back up.Now if you have a foldout or a slide out here in the front, you may be thinking that this is incompatible. Well, that's not true. If we need to use those things, we can take out the anti-rattle bolt and easily lift it off. Now as you can see, this frees up the front of our camper. If we need to access our propane tanks, not a problem. We'll just remove the anti-rattle bolt here and lift this piece out.And with it removed, it gives us access to our manual crank on our jack. 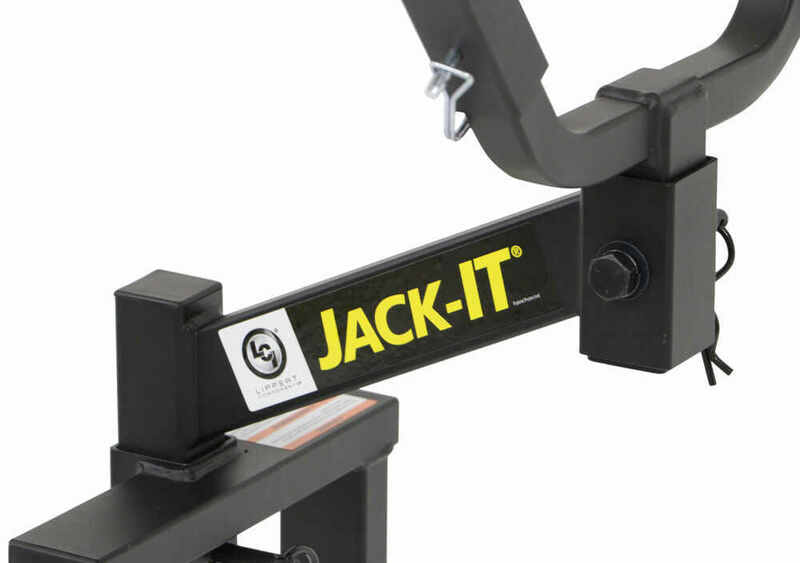 Speaking of your jack, you can't have more than 22 and a half inches from the top of your A-frame to the top of your jack. 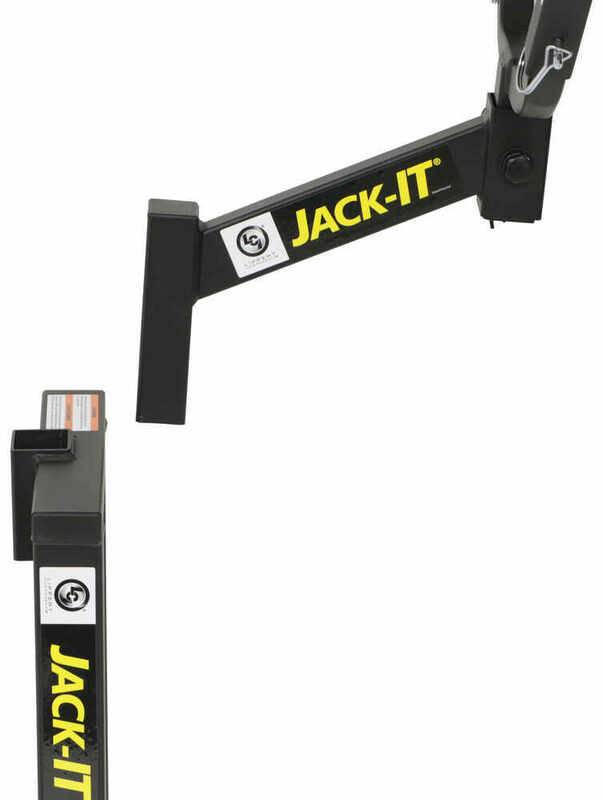 Now if you have a manual jack with a top wind or a side wind, you may be out of luck there. It needs to be in the front. That way it clears the frame.Now it's going to work with most A-frame jacks. Just as long as your jack meets those height requirements that we mentioned. It installs between your A-frame and your jack. 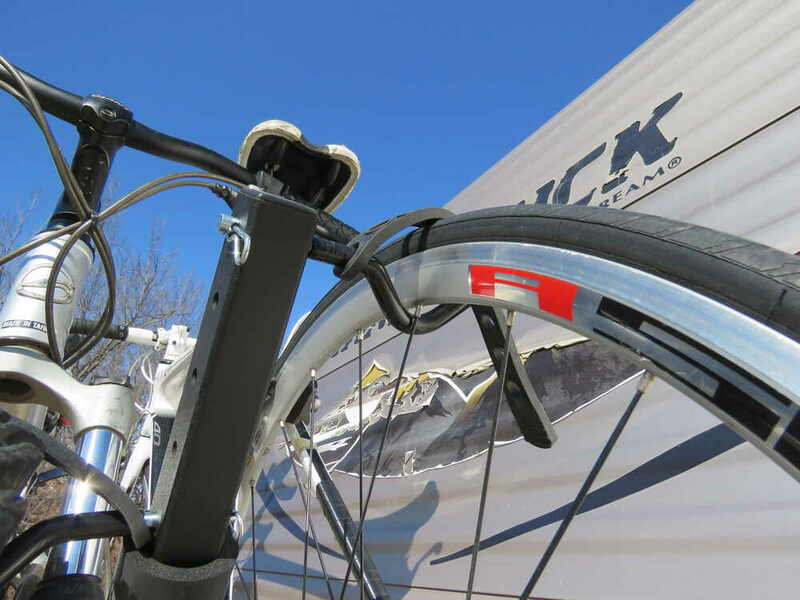 Now if you're concerned about the inside width of the frame, it's seven and three-eighths of an inch, so you're jacks width will need to be under that. Another option you have for saving space is the two arms could be removed.You'll simply pull the pin and clip here and then it just slides off. 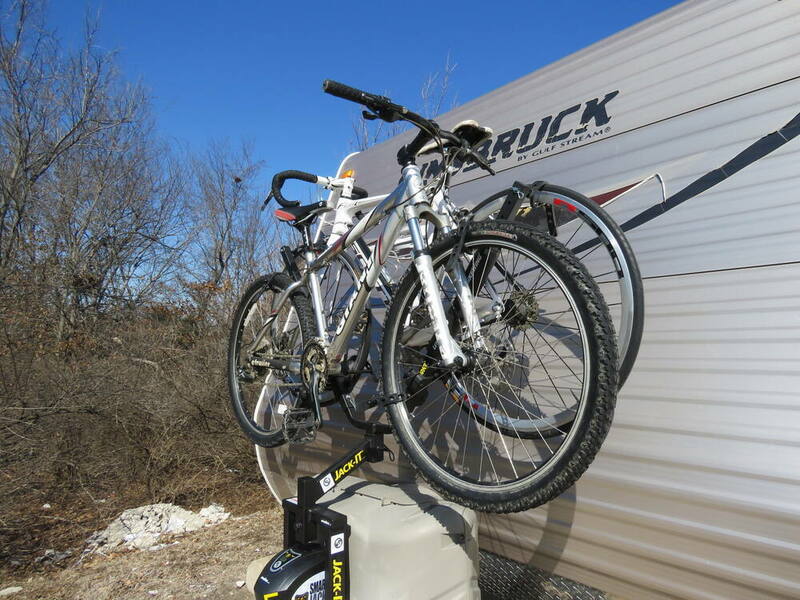 Now this may be handy when maybe putting a cover over your RV or maybe when your bike rack is just not in use. When it comes to loading up our bikes. Depending on your trailer, it may be a bit high, but it's really not that bad. We just need to set our wheels in place within the cradle hooks here. Go ahead and load up my last bike. I'll lift it up and just set it in place. Now you may need to rotate your crank out of the way.Once we've done that, we can then just set it in place. Once we've got our bike positioned where we want and our pads adjusted to the right area, we can run our straps. Just pull it down over the peg on each side.With my truck in place and connected, I'd like to point out a few things. 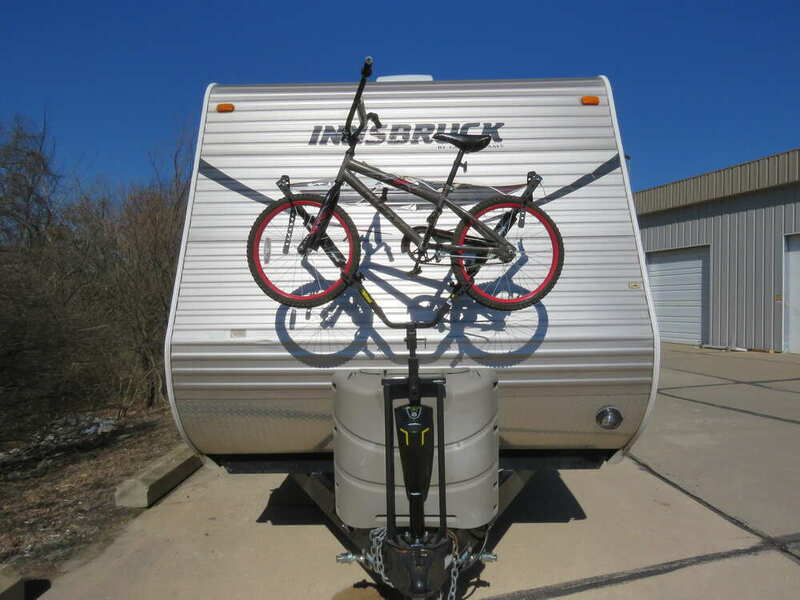 We don't need to worry about our bike rack coming in contact. 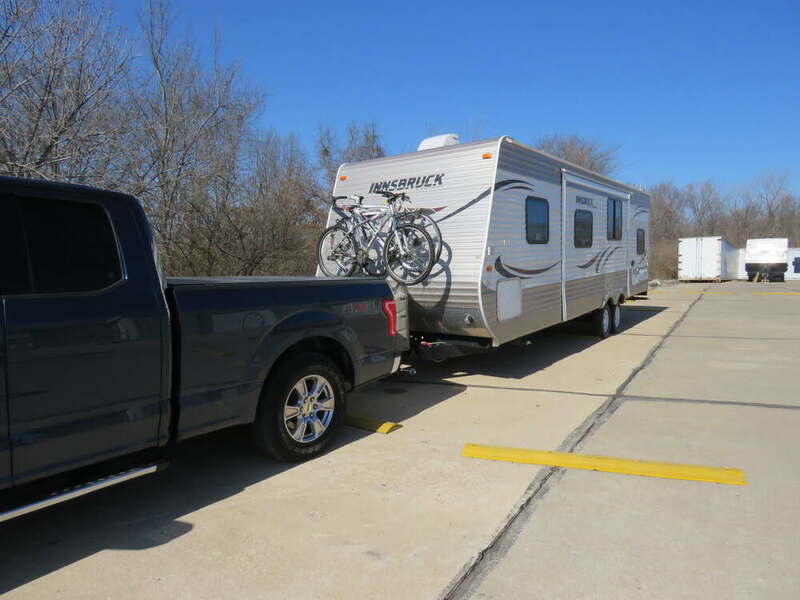 It's not going to interfere with our towing set up. It's nice and high so we're not gonna have any problem keeping an eye on them through our rear view window. 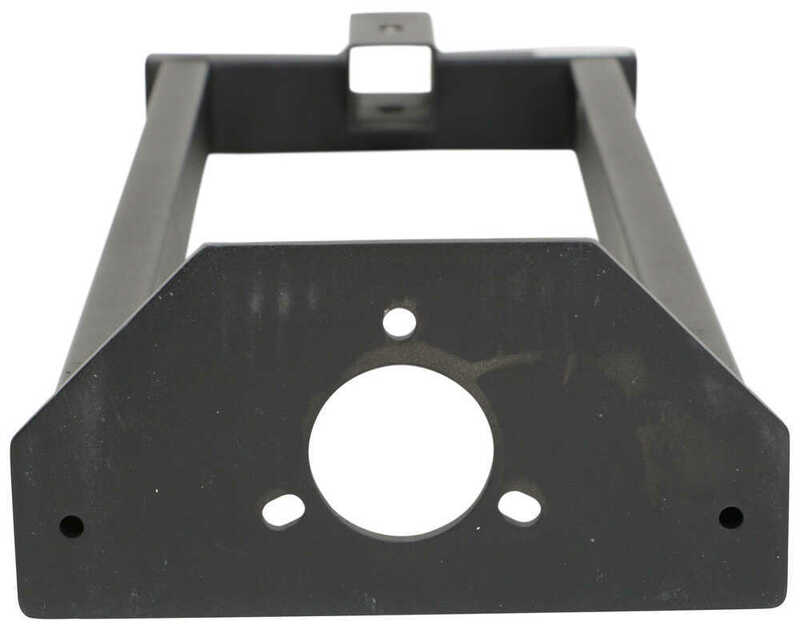 And another great thing is we don't need to worry about them getting smacked around, being carried behind our trailer with all of that wind.Now the whole thing is made out of a sturdy steel construction with a nice black powder coat finish. So right away, we don't need to worry about the elements causing any harm. We don't need to worry about rust or corrosion, but with everything all loaded up, let's go ahead and take it out for a spin and see how it holds up.Here on our test course, let's first go into some speed bumps. This is going to simulate going over some potholes or uneven pavement. And then here into our slalom. 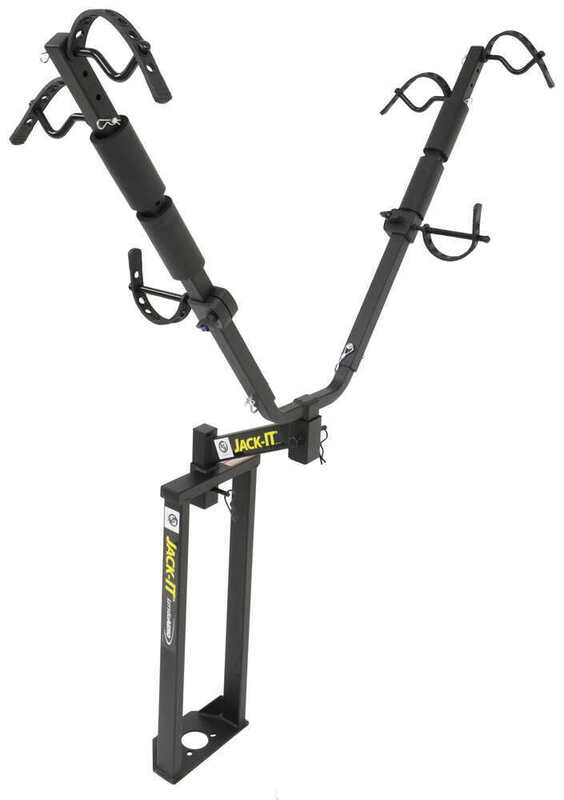 This is going to show some side to side action, such as going around corners or evasive maneuvering.And now you've had a good look at Lippert Jack-It 2 bike rack for A-frames. 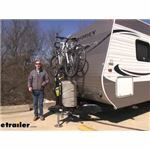 Order: RelevanceNewestRating - High to LowRating - Low to High This bike rack installs on your A-frame trailer and lets you carry 2 bikes of almost any size or style by the wheels - no adapter bar needed. 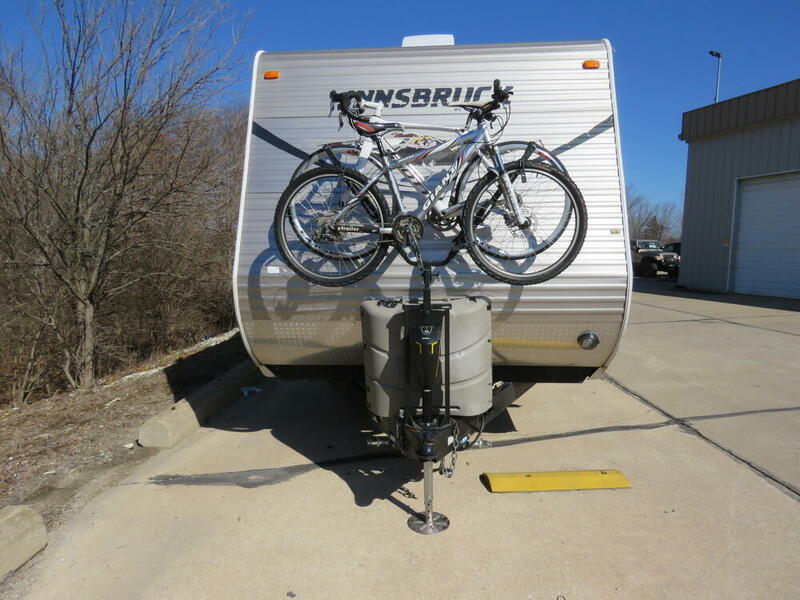 Keeps your bikes safely behind your tow vehicle where you can see them. 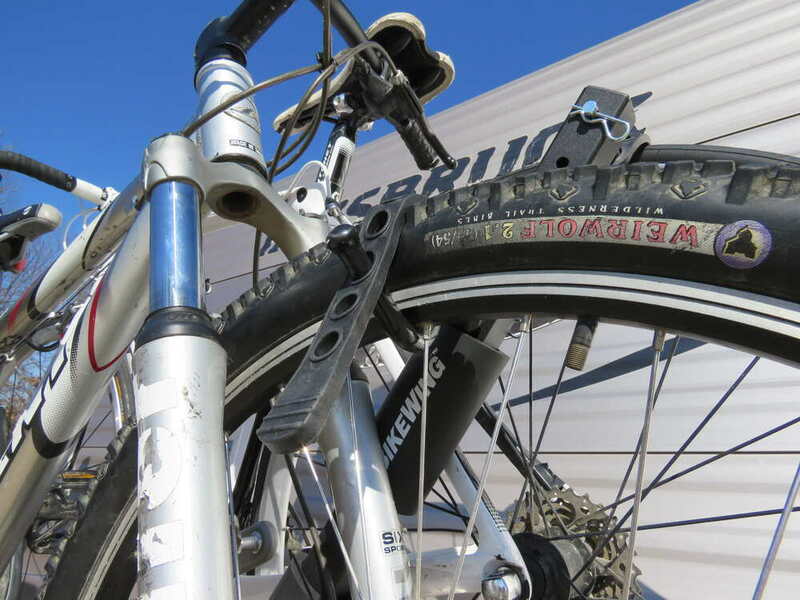 Foam bumpers protect bicycle finish. 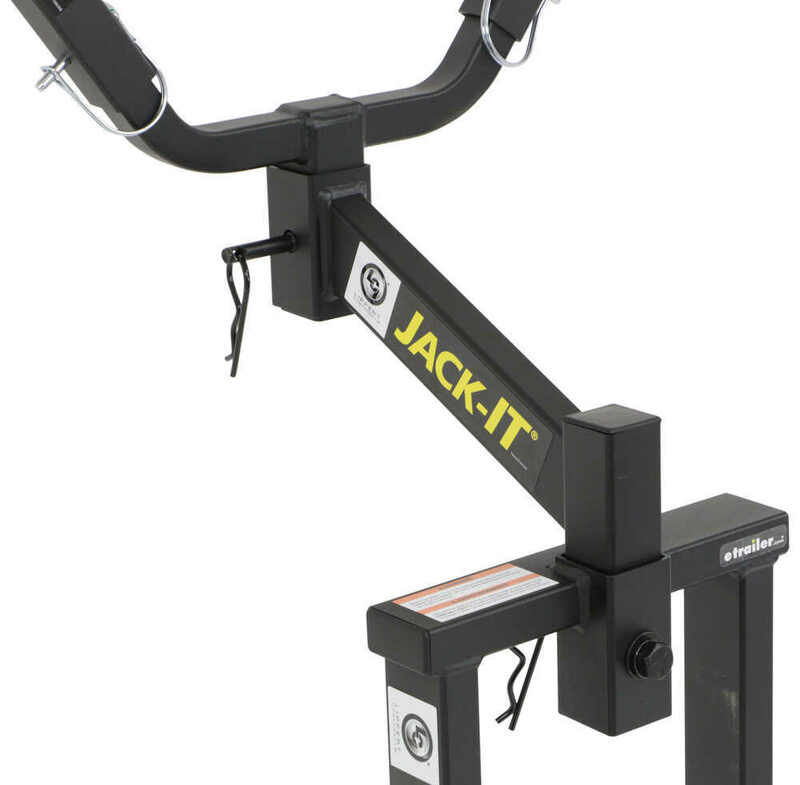 The Jack-It 2 Bike Rack for A-Frame Trailers # LC429756 that you referenced is designed to fit over standard A-frame jacks and be high enough to fit over propane tanks as well. Since it's hard to know for certain how well it would fit your trailer you'd want to check out the dimension picture I attached and compare it to your trailer to know for sure. 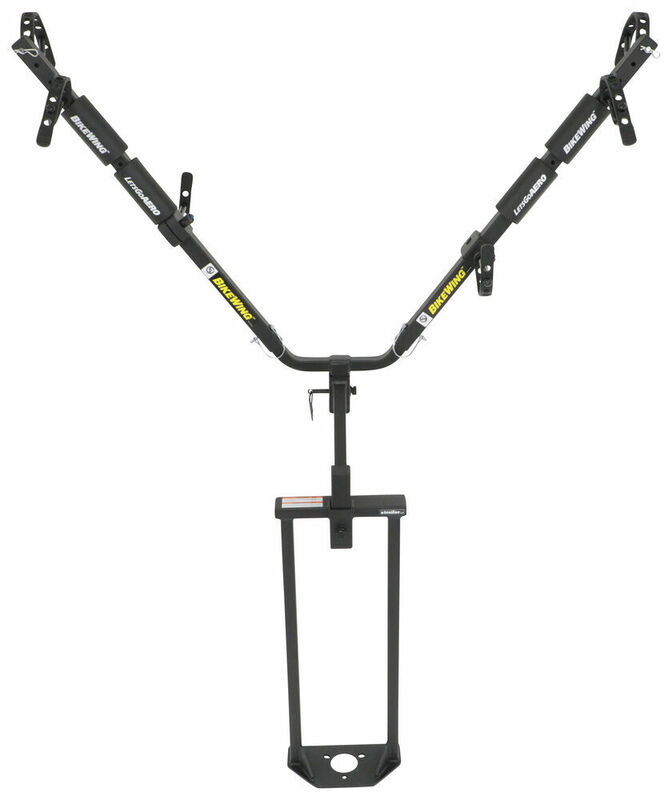 The additional weight of this rack ( 34 lbs) plus the weight of your bikes would get factored as tongue weight. 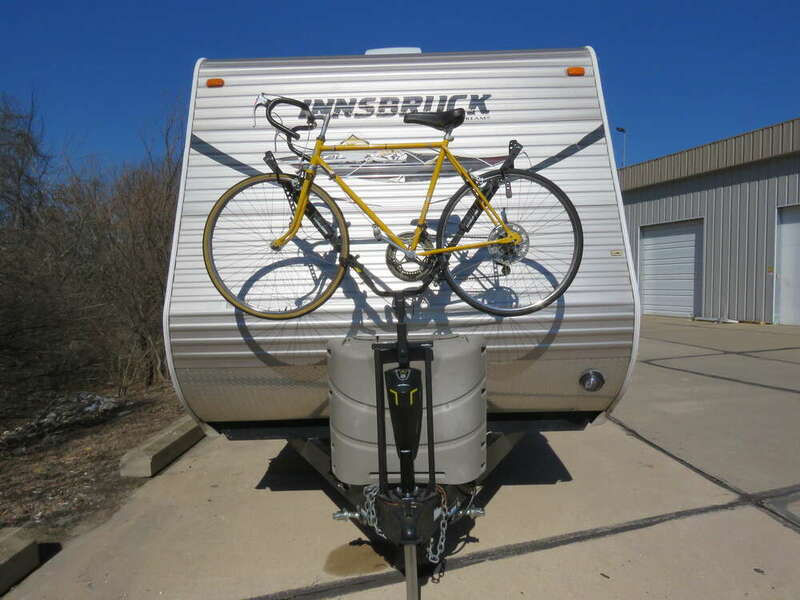 I have a great bike rack option for what you are wanting. 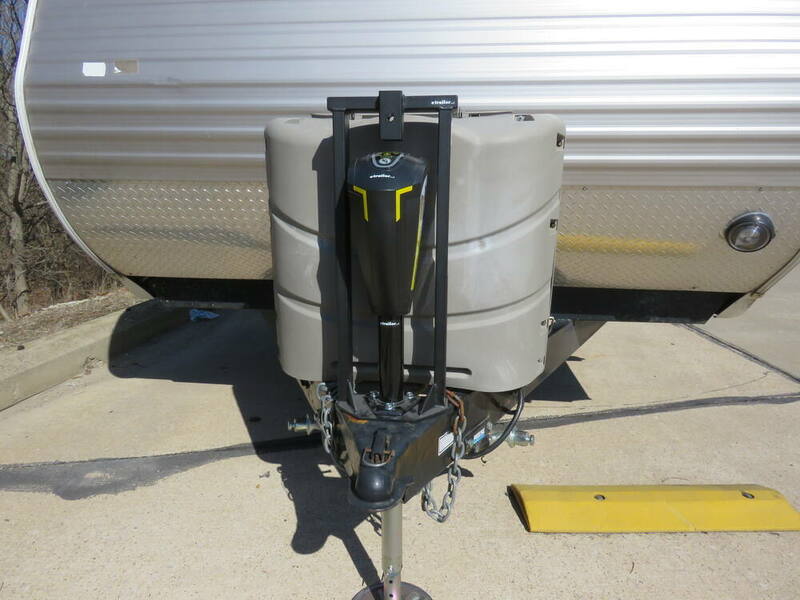 The Lippert Jack It part # LC429756 attaches to the jack mounting hardware on your A-frame trailer and allows you to carry two bikes when you are towing. 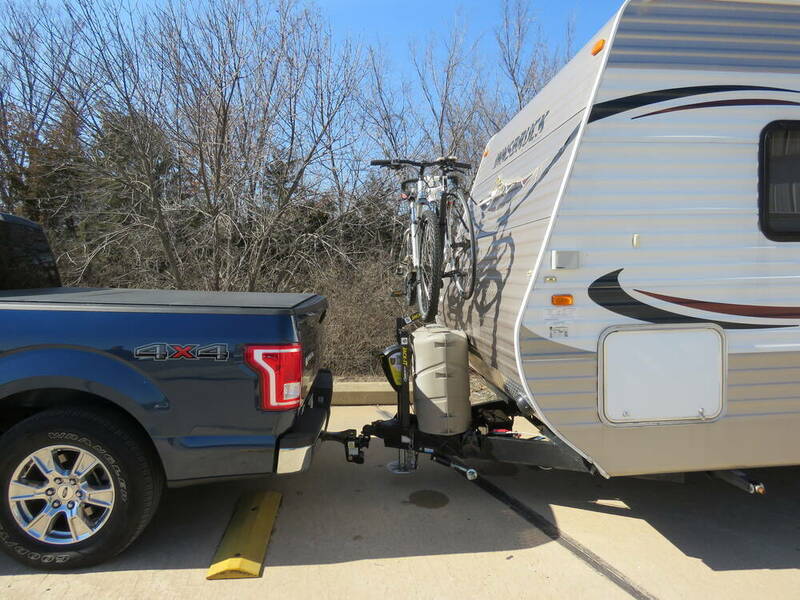 Then when you aren't towing you use the Bump It adapter part # LC723359 and you now have a bike rack that fits in your vehicle's trailer hitch. 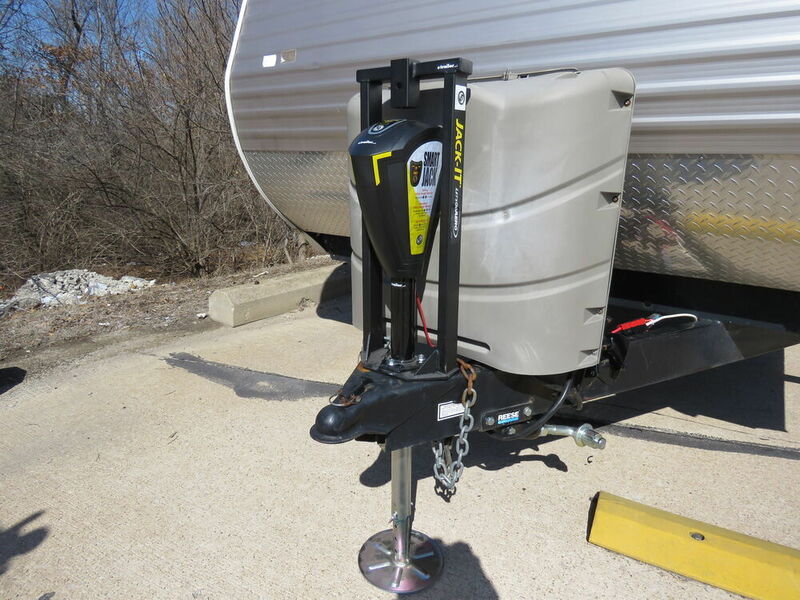 This adapter also can fit in 2 inch or 1-1/4 inch hitch openings so it will work great in your 1-1/4 inch hitch. 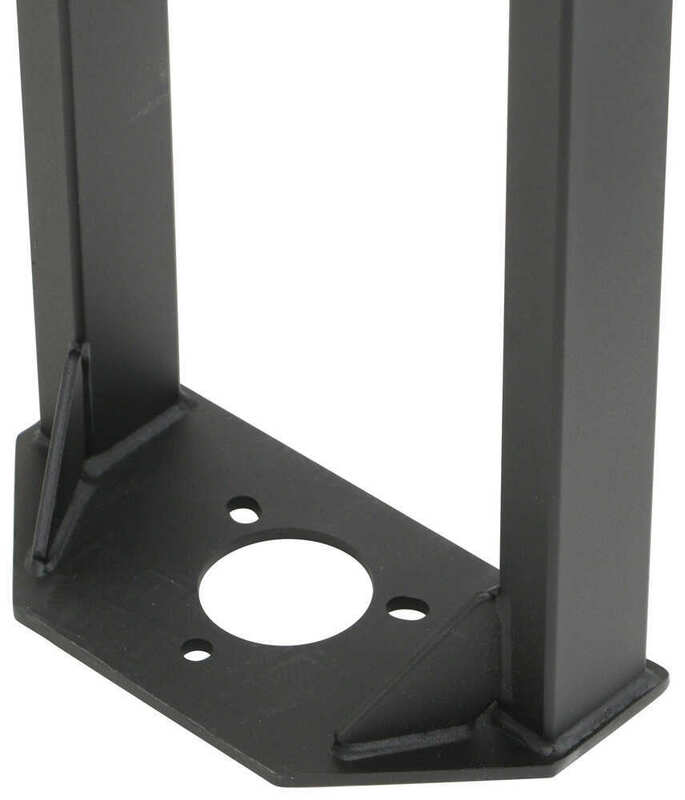 The part the Jack-It # LC429756 that holds the bike rack part is held to the base assembly with one bolt. The bike rack itself is also held in with a bolt. So either way, whether you want to take off the whole top assembly or just he bike rack part, you are removing one bolt so it will be very easy to do. I have included a picture pointing out the 2 bolts I mentioned. 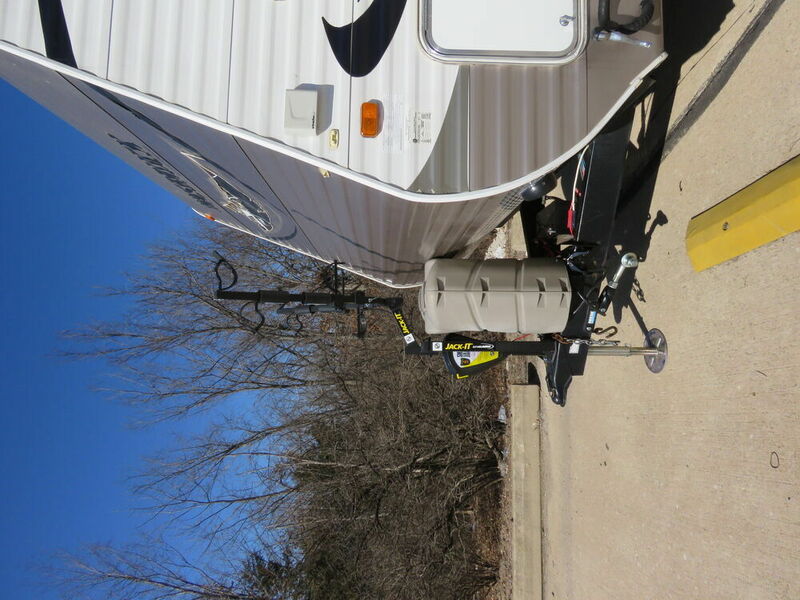 If you wanted a similar setup that could be transfered to a vehicle hitch once you reach your destination you'd want to use the bike bunk adapter part # CC-275 installed on the A-frame of your trailer and then use the Let's Go Aero Hitch bike rack part # B01311 with the adapter which you could then transfer easily to a vehicle hitch. 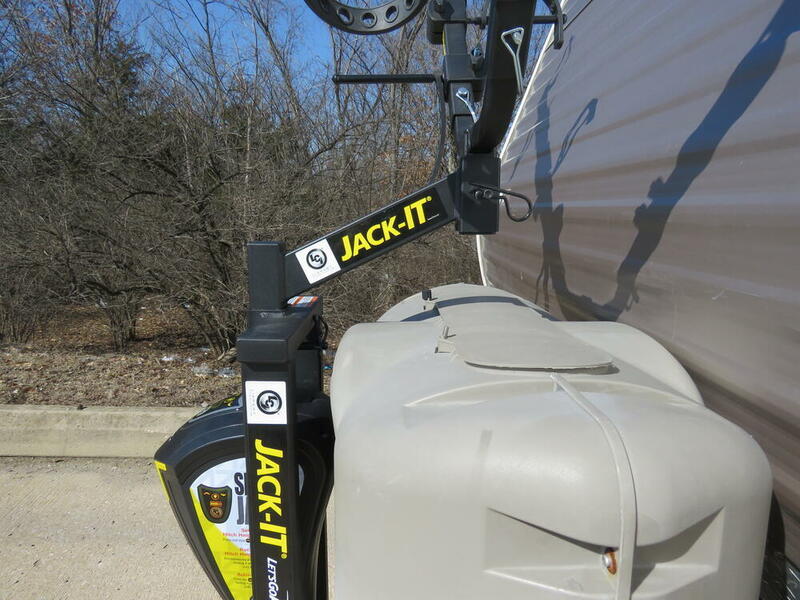 The Jack-It Bike Rack part # LC429756 can not be used in a trailer hitch. I checked with Lippert, manufacturer of the Jack-It # LC429756 and they do not list an alternate shank. The only thing I can think of is that people are modifying it to fit their needs. 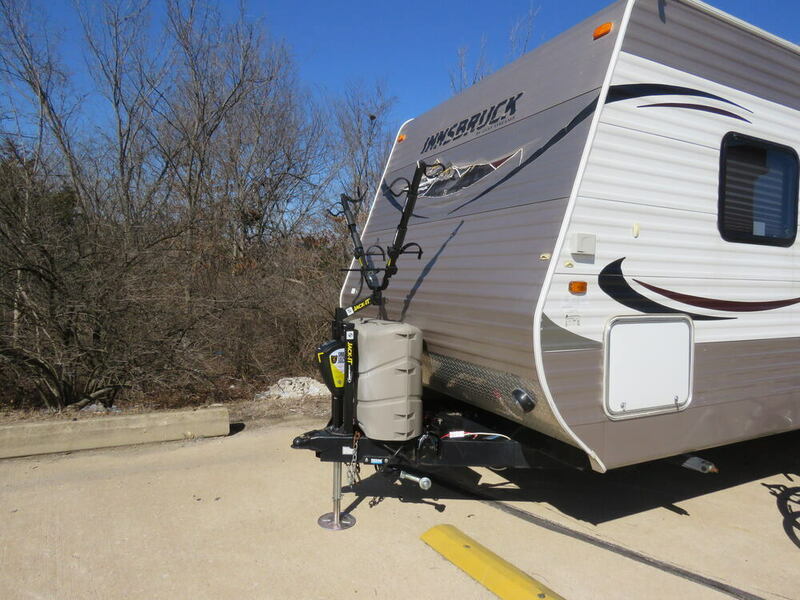 You could instead use the Bike Bunk, # CC-275, with the BikeWing, # B01311. 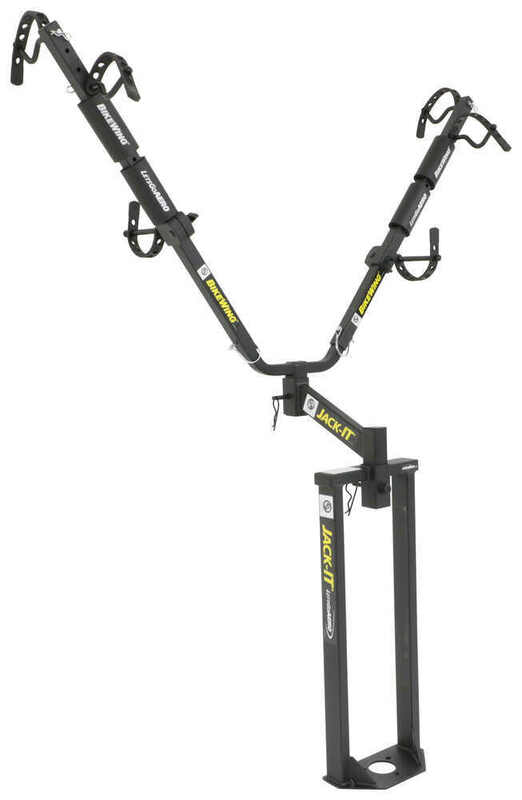 This will allow you to place the Bike Bunk on the A-frame at a spacing as narrow as 12 inches and as much as 52 inches (and basically anything in between).